April 9, 2018 at 10:14p.m. 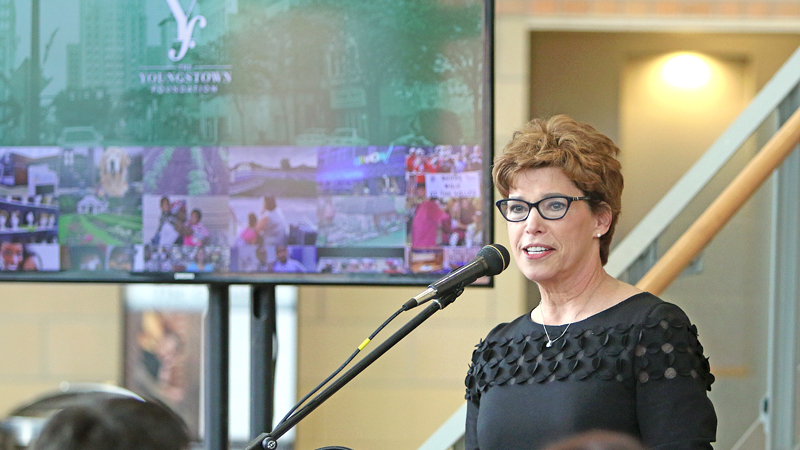 Photo by Robert K. Yosay | Jan Strasfeld, executive director of the Youngstown Foundation, announces that the foundation will double the add-on it gives to nonprofits that receive donations through its Support Fund. The announcement is a way for the foundation to celebrate its 100th anniversary. Jan Strasfeld, Youngstown Foundation executive director, will be live on Vindy Radio today at 10 a.m. to discuss the foundation’s decision to double the add-on it gives to nonprofits that receive donations through its Support Fund. Watch the interview on Vindy.com. On the date of its 100th anniversary, the Youngstown Foundation decided to double the add-on it gives to nonprofits that receive donations through its Support Fund. “We are very fortunate to have many committed donors and supporters who utilize the Youngstown Foundation as a vehicle to donate to the food bank and we certainly appreciate the foundation,” said Michael Iberis, executive director of Second Harvest Food Bank. The Youngstown Foundation announced it would increase the add-on for its Support Fund recipients from 5 percent to 10 percent on Monday. The announcement is a way for the foundation to celebrate its 100th anniversary. In November, the Youngstown amphitheater project received $3 million from the foundation to kick off the celebration of the 100th anniversary. The foundation, a public charity, was established by a group of industrial pioneers with a $33,000 investment. The foundation has awarded more than $100 million in grants in the last 100 years. The foundation’s Support Fund was established more than 35 years ago. Approved charities can receive an additional 5 percent add-on grant to donations they receive, but now that has been increased indefinitely to a 10 percent add-on. There are 77 local agencies enrolled in the Support Fund. Since it started, agencies have received $30 million through the Support Fund. “We are trying to partner with agencies that are addressing critical issues and are solid entities providing critical needs,” said Jan Strasfeld, executive director of the foundation. Bruce Sherman, president of Sherman Creative Promotions of Boardman, donates to several nonprofits through the foundation including OH WOW! The Roger and Gloria Jones Children’s Center for Science & Technology, Youngstown Area Jewish Federation, Youngstown CityScape and the American Red Cross. “The way our nonprofits struggle, 5 percent is a lot of money and now 10 is phenomenal,” said Sherman, who is also a board member for OH WOW!. To donate through the Support Fund, go to the Youngstown Foundation’s website: https://www.youngstownfoundation.org. April 9, 2018 9:44 a.m.
January 1, 2009 12:07 a.m.